We will start with blood pressure, and as such, we need to review the general anatomy of the cardiovascular system. Here you will find a very simple, general overview, and are then referred to the Kaplan book and other resources detailed below for your more detailed assignments. Questions are welcome; indeed, questions are a sign that you are thinking. The image above shows that the heart is divided into 2 sides, creatively called the “right” and the “left”. Then there are upper and lower chambers: the upper is called the atrium (Latin: central room of a Roman household) and collects blood to pass on to the ventricle (Latin: “little belly”). Typical shorthand is to refer to each chamber as a combination of “R” or “L”, “A” or “V”, so LV is left ventricle, RA is right atrium. 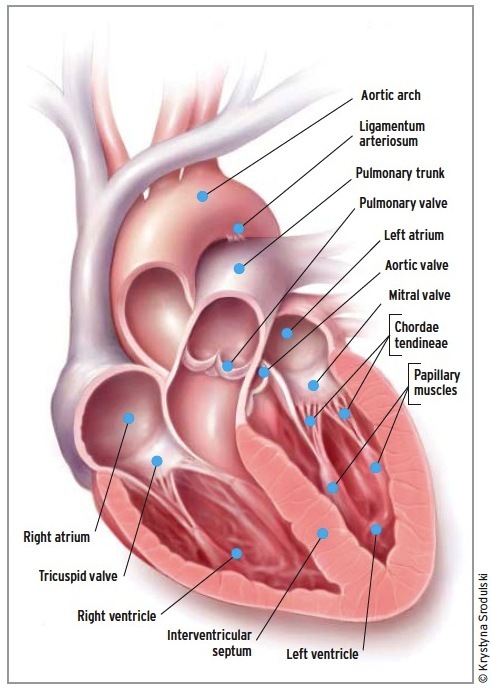 There are valves that separate all these chambers: the RA and RV are divided by the tricuspid valve; the RV and pulmonary artery (leading to the lungs) are divided by the pulmonic valve. The LA and LV are divided by the mitral valve; the LV and aorta (leading to the body) are divided by the aortic valve. It is the opening and closing of these valves during the cardiac cycle that make the familiar “lub-dub” you hear through a stethescope. Assignment #1: Grok pages 197-201 of the Kaplan anatomy book, to include creative coloring. You should then go to the University of Minnesota’s Atlas of Cardiac Anatomy and look around; especially look at the Visible Heart videos; this is great stuff. In general, the role of the right side of the heart is to collect blood from the body, and pass it to the lungs (right atrium–> right ventricle–> lungs), and the left side of the heart is to collect that same blood from the lungs, and pump it to the body (lungs–>left atrium–> left ventricle–> body). Although the jobs sound similar, there could not be a bigger difference between the two sides. The left side of the heart is strong, muscular, and thick-walled, producing the familiar pressures of 120/80 you see on a blood pressure cuff; the right side is weak & puny, almost like a handkerchief draped over the left side, producing pressures of, say, 20/5. The valves are meant to keep the flow unidirectional; damage or irregularities to these valves cause the heart murmurs heard on physical exam. Assignment #2: Grok page 193 of the Kaplan anatomy book. Trace the flow of blood with your finger. Ask yourself, what would happen if one of the valves were messed up, and leaky (regurgitation)? What would happen if they were too tight (stenotic)? Hints here. Once the blood leaves the LV, it enters the aorta. Here we find a rather elegant solution to a daunting physiological problem: the human body requires continuous blood flow to work well, but has a pump that produces intermittent pulses of flow. The walls of the aorta are muscular and act like elastic, heavy-duty rubber tubing (please see Kaplan book, page 205). When the LV pumps out the blood (called systole), it stretches the aorta like a balloon, and “stores” pressure to compensate for the drop in pressure seen when the left ventricle is between pulses (called diastole). This is directly analogous to the use of a capacitor as part of a circuit to rectify AC to DC current, for the engineers in the group. And when watching on monitors, it looks like this. Please note, it’s the red waveform that is the arterial; ignore the others for now. In real life, we use ultrasound to perform an echocardiogram if we want to know what is going on with the heart or the valves. Please view this video, and this one, to get a feel for what a heart looks like on the inside, when in motion. I put this here, just as show; the anatomy as seen on echocardiograms is well beyond the scope of this post (although if you are motivated I certainly won’t stop you). 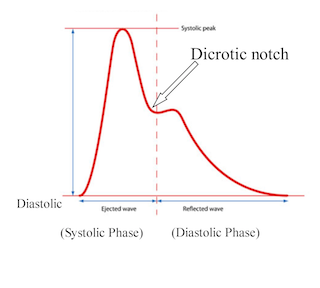 Assignment #3: Google “dicrotic notch”, post your findings to comments. Next post will review the arterial anatomy and pressure points to stop bleeding, as well as a few practical exercises for the learner. Did you mean to say, “…; the LV and aorta… are divided by the aortic valve“? First off. Thank you for your effort on this project. There is a need for a better knowledge base in this area. Thanks for stepping up to the plate. Now I’m going to be an a$$ hole and take issue with a minor and peripheral point. “Pain as a vital sign BS” is doing patients a disservice. There are many well documented reasons I would disagree with but I am going to focus on the one I know best. Failure to address pain after pediatric orthopedic injuries of the extremities leads patients not to move them. (Guarding the injured site) Very quickly there is a significant loss of mobility and strength. Want to know why litthe Johnny can’t throw a ball after he broke his arm? Not the surgeons fault. More likely mom or dad not wantin him to “get addicted” to anything. He doesn’t move it for six weeks because it hurts. Even for young healthy kids getting back strength and range of motion takes a lot of time and hard work. My experience is that we aren’t so good at physical therapy (especially if it is uncomfortable) Pain has a lot of consequences that are very important long term and the better job we do addressing it the better outcomes we have after injuries. Pain is certainly nothing to be ignored. I would add to your examples above, that folks who have just had major thoracic or abdominal surgery have a difficult time breathing adequately, and thus develop atelectasis with subsequent high risk for post-operative pneumonia. The link that you reference is to an article that describes the VA’s major initiative to make “Pain the 5th vital sign”, and how the evidence showed afterwards that there was no change or improvement in the quality of the pain control. I personally am very aggressive towards pain control in my patients, most notably when I worked in a Long Term Acute Care Hospital (LTACH). In the ICU, where I spend my time nowadays, I am a little more conservative, as too much pain/sedatives lead patients to become delirious (that is, crazy) and that prolongs their time on the ventilator, time in the ICU, and in some cases, worsens their overall mortality. My final point here is that it is very rare for patients to become addicted to pain pills, in the specific scenario you mention. I always tell patients the following: If you hurt, and the pain meds fix that hurt, the chance you become addicted is essentially zero. If you hurt, and the pain meds don’t fix the hurt, but instead make you so high you “jess dona care, dachta” (said in slurred speech) then your chance of getting addicted is present/significant. If you don’t hurt and you take them anyway, well, that’s just about the definition of addiction. So overall I agree that pain is important and requires both short and long-term control. My gripe is that there is a movement to replace something truly vital (pulse oximetry) with pain, and by so doing, leads to no real change in outcomes.